Note - This volume is also available in a hardbound edition. Click on the link to go to that page. 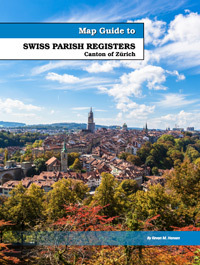 The Map Guide to Swiss Parish Registers series is an out-growth of the very popular Map Guide to German Parish Registers project, which is still in process, but nearing completion. Over the years, we've been asked by numerous parties to extend the project to cover other German-speaking European countries. We did that with the publication of Map Guide to Luxembourg Parish Registers in 2016. There are 26 current cantons in Switzerland. Historic Bern is covered in the first two volumes of this series, and makes up two of those 26, as the current Canton of Jura is in historic Bern Canton. This volume, (Volume Three of the series) covers Canton Zürich, Volume four deals with Canton Fribourg. Canton Aargau is covered in the fifth volume. Switzerland has 26 Cantons. Many of them are small, so we plan to publish guides to multiple cantons in some of the volumes. For this reason, we expect the entire series to be under 20 volumes. The following alphabetical list of 3,307 places are those found in Canton Zürich.